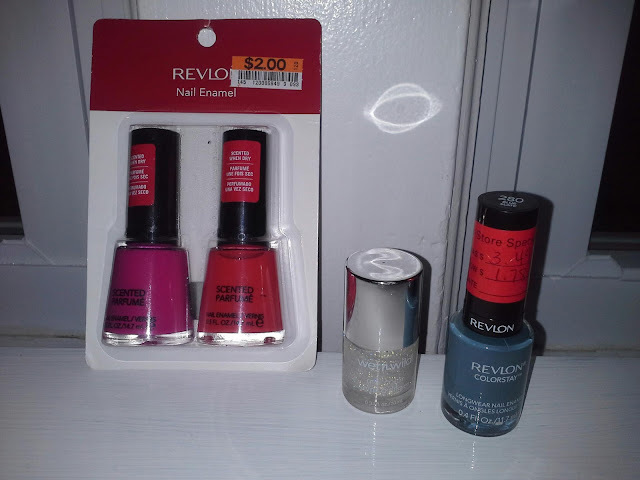 Did a small haul this weekend, hit up big lots first and picked up a 2 pack of scented revlon polishes. Colors/ scents are bubble gum (on left) pretty in papaya (on right). Next up was christmas tree shoppes. They had bins of clearance polishes and i dug through and found revlon colorstay blue slate, marked down to $1.78. I had a $2 coupon= Free! I didn't want to let the extra savings go to waste so i picked up wet n wild seeing stars, a clear with silver hologram glitter, it'll be great for the holidays!